My new site for Christine Bond has recently been launched. 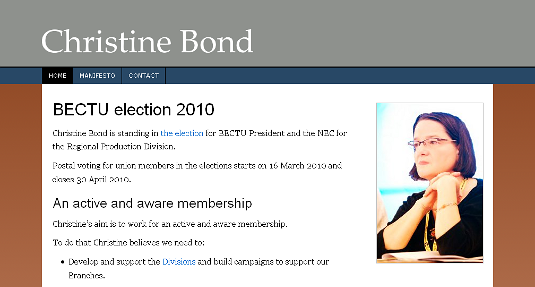 The site is for Christine’s campaign in the BECTU NEC and President elections. I used WordPress to build the site (of course! ), giving a great deal of flexibility to quickly react to developments in the election campaigns in the next few weeks. Christine, coming from a photography background, was detailed in her design brief, and hopefully I’ve brought her ideas to life on the web. Good luck to Christine in the elections!